Europe is probably our favorite continent for traveling with children. Although Europe is the second smallest continent (after Australia), it has an incredible array of different cultures, a varied history, incredible foods and the people of Europe always tempt us back again and again. I’ve lived in Europe throughout my life for a total of 9 years. I grew up in Athens, Greece and a little town in England as a child. Then we recently lived in Southern Germany for 2.5 years. 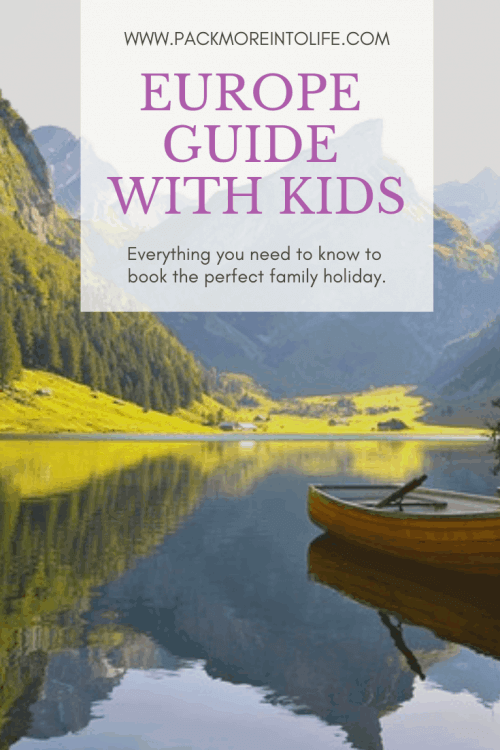 My family and I have explored over 20 European countries and have some great tips on where to go and where to stay with your family. Traveling in Europe with kids is a bit different than traveling as a couple. My husband and I were fortunate to travel before we had children and it involved long days, lots of wine and some fabulous guided tours. I’m not saying that you can’t accomplish those things with young kids, you just need to manage your expectations, create an itinerary that works for the whole family and get a bit creative. I’m here to help you with all of that. I promise that we still toured some fantastic places, walked historic walls and drank plenty of wine, even with a toddler in tow. Traveling as a young family in Europe means that you’ll live more like a local and less like a tourist. You’ll make different memories, such as watching your child/children playing with their new “friends” in a local playground or trying different flavors of ice cream while wandering through a park. I’ll never forget an epic snowball fight that broke out overlooking the nighttime lights of Quebec City. Sure, maybe a romantic stroll would have been fun, but we laughed so hard, and I’m sure the people below could hear us. It was pure joy for my son pelting dad with huge snowballs. Europe is similar to the US in many ways. You’ll still be able to find kids menus in restaurants (you might find a play area too), hotels have cots/pack and plays, and children are often free on public transportation. But there may also be some struggles along the way, like finding a high chair in a restaurant, locating a changing table and dealing with lots of stairs with no elevators in sight. I will help to prepare you, make sure you have the right gear and guarantee that you’ll have some amazing memories with the family. My friends and I always giggle that traveling with kids is just parenting in a new location, but hey, that location is probably cooler than your living room. So don’t be afraid to book that trip! 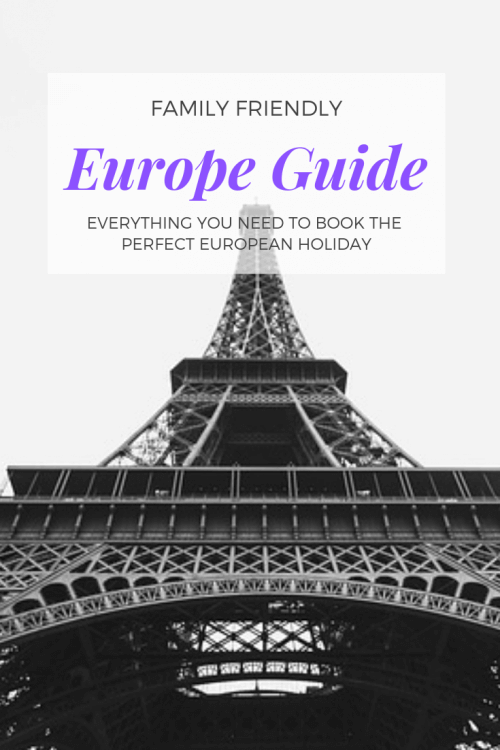 This Europe with kids guide should hopefully answer all of your questions. After traveling so much in Europe, we have our favorite trips that have been great with kids. All of these locations would be appropriate for children of all ages. Even if you don’t have children, there are plenty of tips for adult travelers as well. Trips that meld together beautiful locations, rich cultures and family-friendly aspects like playgrounds, safe areas to explore, fun attractions for kids and easy public transportation or walk-ability of the city. 1. Budapest– This city blew us away. We took a 5 day/4 night trip for Thanksgiving and discovered that Budapest is perfect for a family. 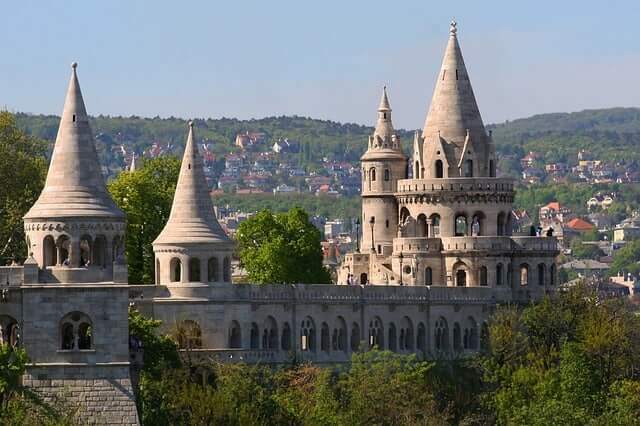 The adults will love the thermal baths, Fisherman’s Bastion and the traditional Christmas markets (Thanksgiving till Christmas). The children will delight with the big bus tour, miniversium (mini train museum), children’s railway and the Budapest zoo. The city is easily walkable, has a vast network of public transportation and is a great value. Read Next: Budapest Guide with Kids. 2. Netherlands– OK, so maybe this isn’t a place, but an entire country, but after multiple trips to the Netherlands, I can’t recommend it enough! Be sure to explore outside of Amsterdam because the countryside is our favorite part. We took a 9 day/8 night trip to the Netherlands in the Spring, and we returned for another long weekend later the next year. 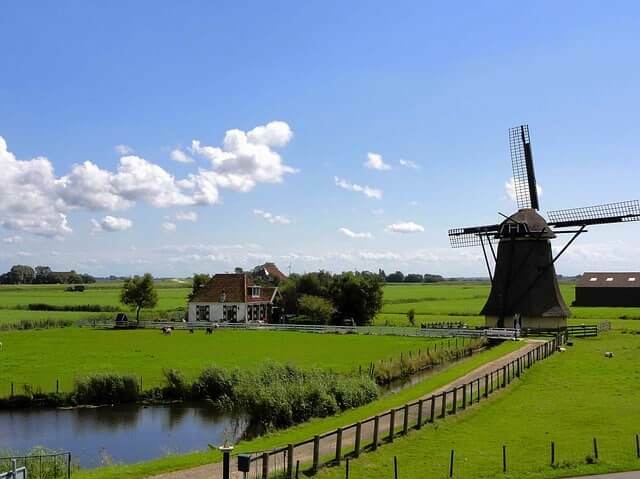 From the vibrant city of Amsterdam to the bike-able pathways, tulip-filled fields, cheese farms, historic windmills, and sandy beaches, the Netherlands is the perfect spot for families. We also loved how warm the people were, and English is easily spoken throughout the country. Read Next: Netherlands Guide with Kids. 3. 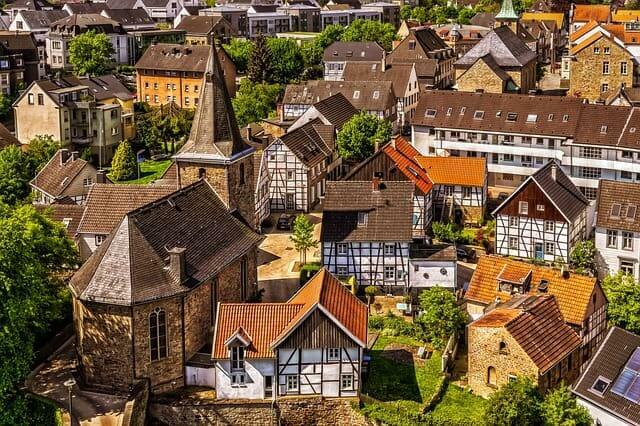 Germany– If you want a clean, organized and well-run place to visit, then be sure to add Germany to your list. I highly recommend Southern Germany, not only because that’s where we explored the most, but because it is a region full of delights. Castle lovers? Be sure to visit some of our favorites such as Neuschwanstein, Hohenzollern, and Heidelberg castles. Enjoy a summer sitting in the biergardens enjoying a glass of beer while the children delight in the wooden playgrounds. Take a traditional barefoot walk in the forest where multiple materials will be a delight of sensations on your feet. Then fly down a rodelbahn (mountain cart) with the wind blowing through your hair. Germany was one of our favorites for how family friendly their culture is. You’ll notice lots of great activities for the children during any festival or event. I know some say that Germans can be a bit blunt, but I can honestly tell you that they will help in a heartbeat, so don’t let that dissuade you. 4. Portugal– One of the first things we noticed in Portugal was how friendly and warm the people are and how much they adore children! Portugal isn’t the first European country that comes to mind, but I can easily say that it takes my breath away. From the vibrant colors of Pena Palace and the Moorish Castle below to the majestic cliffs on the Algarve coast with its beautiful Sahara like beaches and coastal archways. You won’t find as many conveniences such as family restrooms and an abundance of high chairs, but the people of Portugal are happy to help in any way possible. We’ve heard many stories about couples enjoying a nice dinner while the staff loves on their children and surprises them with a treat at the end of the dinner. We can attest to many treats being handed out to our son. 5. Finland- We took an incredible trip to Finland in mid-December to explore the Santa Claus Village in the town of Rovaniemi. Just imagine a winter wonderland that is perfect for kids! You can rent cabins that feature saunas, play in more snow than you can believe, lead a team of huskies on a dog sled ride or glide through the snow pulled by Santa’s reindeer through the Finnish forest! It doesn’t get much better than that… but wait, it does! Visit Santa in his workshop, train with his elves at Santa Park where your kids can learn to be an apprentice elf, decorate cookies and create ornaments. To top it all off, you can take an overnight Santa train to and from Helsinki, for easy connections to and from major airports around the world. We hope to make it back for another trip before my son loses the magic of Christmas. Read Next: The Magic of Christmas in Finland. 6. Switzerland- Switzerland is a country where you will never have to look far to see immense beauty in the landscape. It is one of the more expensive places that you’ll visit, but if you are outdoor enthusiasts like we are, this is the country for you! Living just two hours north of Switzerland certainly had its advantages, but with its major airport of Zurich and convenient train transportation, it is a simple country to visit. 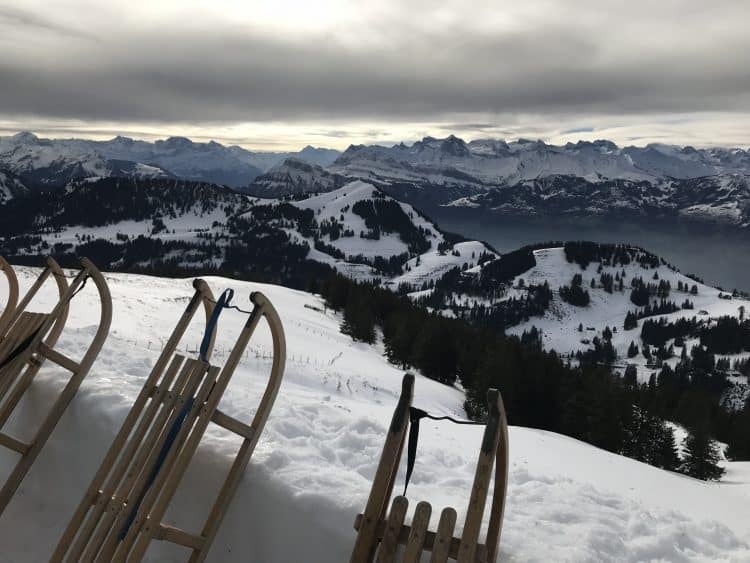 We were frequent visitors spending long weekends up in the mountains enjoying cliff-side walks, eating fondue, checking out the fantastic transportation museum in Lucerne and going tobogganing down towering mountains in the winter. I hope to return to check out the chocolate and cheese train someday! Read Next: Long Weekend in Grindelwald. It is often hard to know how much a trip to Europe might cost. With so many amazing flight deals to Europe, it’s nice to know about how much you’ll spend once you arrive. Here are some of the major expenses that you’ll incur, some cost saving tips and how much to budget. Accommodations: This is going to depend on which country and whether you are staying in an airbnb or a hotel. There is also a wide preference to the style of travel that you like (luxury vs. budget). Outside of major cities like London, Paris and Rome, you can typically find a 1-2 bedroom airbnb for around 100 euros per night (around $115 per night). If you’ve never stayed in an airbnb, head to this link for things to consider and this link get a discount towards your first stay. Another option is staying in a hotel, which works well for some families and comes with a level of safety, services and often free breakfast. Be sure to book the actual number of family members you have in your party, hotels have size restrictions for the amount of people allowed in a room and you don’t want an up-charge when you arrive. Also pay attention to the fine print about added costs for linens (even for the pull out couch). We like using Booking.com to research and reserve hotel rooms due to their rewards program, free cancellation (in most cases) and support. Activities: Tours, tickets for museums, tickets for the cable car up a mountain and renting bikes to explore are all extras that can add up quickly. I like to plan before we travel, which means booking my tours ahead of time and being able to accommodate for added expenses. If you are not a planner like me, do some quick research to see what things cost, or build in a 50-100 euro per day added cost to make sure you can cover these little extras. 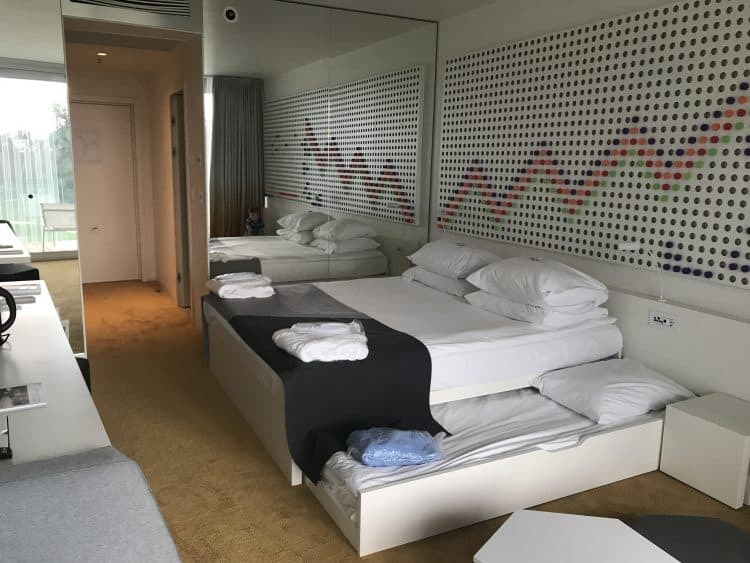 So without the cost of flights, you are looking at spending around 250 euros per day on the low end and up to 500 euros on the high end (you can always go higher). That should cover a family of four with two smaller children that can possibly share meals and won’t cost extra for accommodations or activities. Budget higher for older children since you’ll be paying adult prices for everyone in the group. Total: For a 10-day vacation to Europe, you are looking at around 2,500 euros or just shy of $3k, not including flights or added expenses like rental cars. Eastern Europe is often less expensive than Western Europe, but also smaller towns and lesser known places will help you stretch your travel budget. These are some of our favorite places to travel where you can extend your money just a bit further with lower costs of accommodations, food, and activities. Slovenia: This lesser known location can be the perfect budget-friendly place to visit with its castles, snow-capped mountains and thriving food scene. Slovenia has many similar things to offer when compared with its neighbors Italy and Austria, but at a much-reduced cost. Lake Bled is a beautiful place to stay and convenient to explore the country. If airfare is throwing you off, consider flying into a larger city and then purchasing connecting flights from budget airlines in Europe such as EasyJet and Wizz Air. 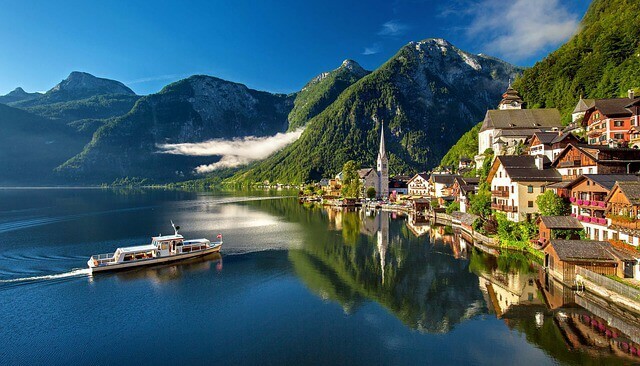 Austria: Austria is a beautiful country with towering mountains, rolling countryside and histories cities such as Salzburg and Vienna, as well as smaller lake towns such as Hallstatt. There are plenty of fabulous apartments in the pristine landscape of Austria. Close enough to all the major attractions, but for the bargain price for their two bedroom apartment. If you are looking for the perfect mix of cities and alpine mountain villages, this is the ideal country for you. 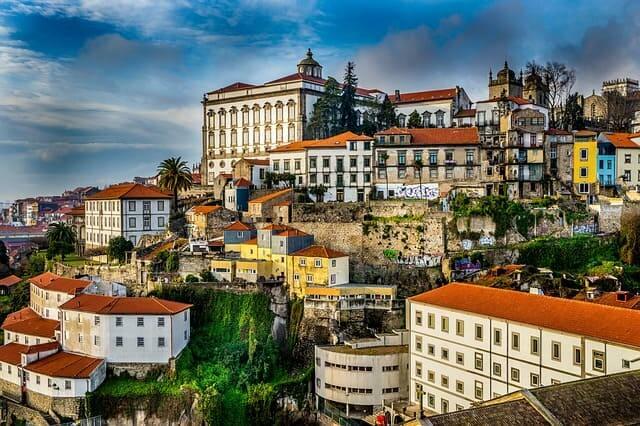 Portugal: Known for its fantastic culture, sandy beaches, warm sunshine, and incredible food. Portugal is also a great budget-friendly destination with its low-cost accommodations, inexpensive eateries and wonderful wines. Be sure to pick up a few bottles for less than $5 each! Most of our trips involve a place to rest our head at night, maybe prepare a quick breakfast and are central to where we are staying. On a few longer trips, we decided to incorporate a family hotel and let me tell you, the best idea I’ve had yet! Here are two beautiful places to stay with the family because they include kids clubs, all-inclusive meals, playgrounds, water play areas, beaches and entertainment for everyone. –Family Hotel Amarin – Kinder hotels and family hotels are all over Europe and are some of our favorite places to stay. 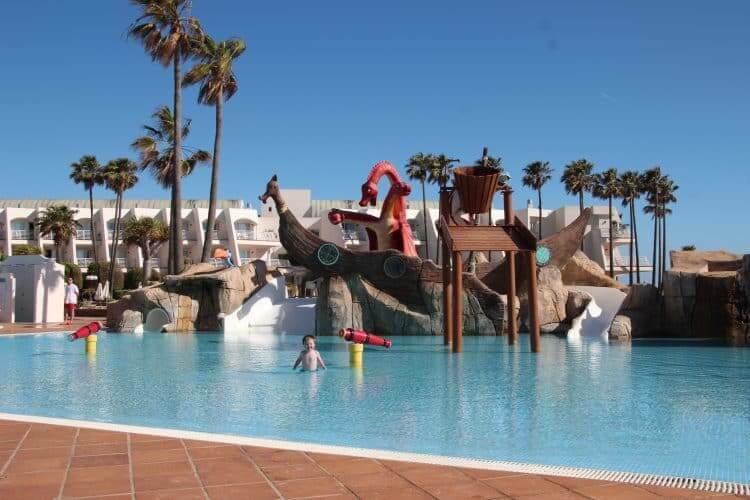 They are slightly more expensive, but that is because it includes dining, children’s clubs (even for under 2 typically), activities and plenty of family fun. We were able to visit Family Hotel Amarin in Croatia just after it opened and it was a beautiful complex. Heated indoor pool with slides, bright kid rooms, playgrounds all over the complex and a 3 story net structure in the lobby. Everything from face painting to childcare and excellent food was all included. –Iberostar Royal Andalus- This hotel/resort is located in Southern Spain. It is a beach resort that features multiple pools, a splash pad, wide sandy beach, international cuisine, and a golf course. The children’s club is fully functional in the summer and holiday breaks but is much more straightforward. We enjoyed its family-friendly features, without being a kinder hotel with children all around. It was a nice balance. Traveling with kids, car seats, train, budget airlines, things to consider. 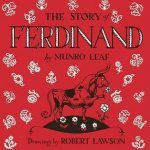 Traveling with kids to Europe? What gear should I bring? Check out our recommended gear post. We’ve traveled with all of the items we suggest. From lightweight car seats and strollers to hiking carriers and kids luggage. Planning on renting a car? You can either rent a car seat with your car or bring one with you. We love our Ride Safer Travel Vest for kids ages 3+, but be sure to pair it with a travel booster (which is required in Europe). Children under the age of 4 travel free on most trains (some up until age 6), be sure to check before booking tickets on Rail Europe. If you are traveling with smaller children and require the use of a stroller, make sure that is it one that can easily fold and has large enough wheels to handle the cobblestones, uneven pavement and narrow streets of Europe. Our family favorites were the City Mini GT by Baby Jogger and the Maclaren Techno XT. Finding diapers and other baby needs is easy in Europe; even name brands like Huggies and Pampers. Pack enough to last for a few days and then head to stores like Carrefour, DM, Real, and supermarkets. They are also typically less expensive than in the US. Bring favorite snacks! Yes, you can find plenty of treats, but I know my son always prefers his favorite granola bars. So if it is a favorite, pack a couple of extra boxes in your suitcase and carry-on. Bring a baby carrier for kids 3 and under. Europe requires quite a bit of walking, and some places do not allow strollers, so play it safe and bring your favorite baby carrier. We love brands like Tula and Kinderpack. Patience! We always joke that traveling with kids is like parenting in another location. Your kids are still kids, and they will have their moments. Don’t let this keep you from traveling, just be prepared to slow down a little and be flexible. You’ll still have a fabulous trip! Europe is beautiful year round! There are so many wonderful festivals, events, and celebrations throughout the year. I’ll share some of our favorite places to visit depending on the time of year. From favorite ski towns, unique festivals with huge parades, favorites like the European Christmas markets and more. The best part? European festivals typically have a kids area with tons of free activities and rides. Winter: If you want to visit Europe in the winter, you’ll be delighted with a whole host of events and festivities. Living in Europe during the Winter can often be a bit dreary with cold temperatures, lack of daylight and gloomy days, but the festivals can help to brighten anyone’s mood. Here are some of our favorites. 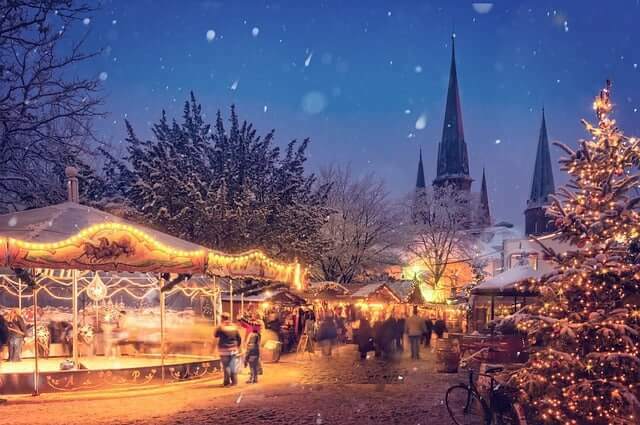 Christmas Markets: If you come in the month of December (up until Christmas), you will be delighted with Christmas markets in the countries of Germany, Austria and Switzerland. Many cities throughout Europe also host Christmas markets, such as London, Helsinki, Paris, Prague and Budapest, but nothing beats a traditional German Christmas market with bratwurst, Glühwein, lebkuchen and wooden ornaments. Skiing/Tobogganing: From December until March, you can easily find enough snow to enjoy during a winter holiday. Finding a ski town like Söll, Austria where you can enjoy skiing either with or without the kids (they can go to ski school, or kids care), then tobogganing with the whole family on mile-long tracks that wind down the mountains. I will say some of the toboggan routes are not for the faint of heart. We enjoyed a winter escape to Switzerland and decided to test out the tracks on Mt Rigi; there were some moments that I was glad my husband was holding our son. 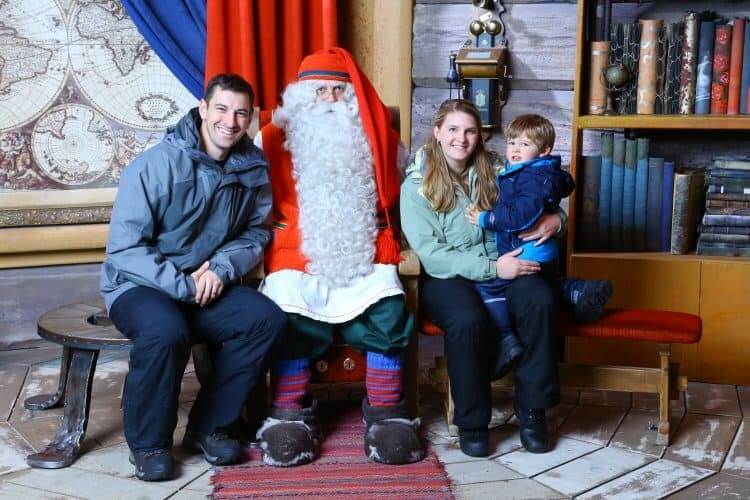 Visiting Santa Claus: This is best for the kids that still believe in a bit of Christmas magic, but this place will even make the adult in us believe in St. Nick. 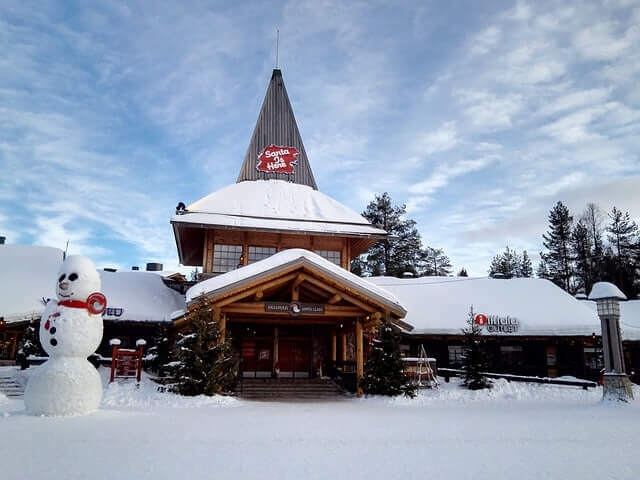 There is a village just outside the city of Rovaniemi where the spirit of Christmas is truly magical. Stay in a cabin at the Santa Claus Village to enjoy a snow filled holiday complete with dog sled rides, roasted s’mores over the fire, reindeer sleigh rides through the Finnish forests and chasing the elusive Northern Lights. Top it all off with Santa Park where the kids can learn what it takes to be one of Santa’s elves, decorate Christmas cookies and admire some beautiful ice carvings. It is a trip of a lifetime! Spring: This is a favorite time of year in our family. Warmer weather beckons us from inside and the flowers slowly start emerging in the gardens. It is also the perfect time to enjoy Europe before the throws of summer tourism (just watch for Spring Break/Easter). Here are some of our favorite places to visit during the Spring season. 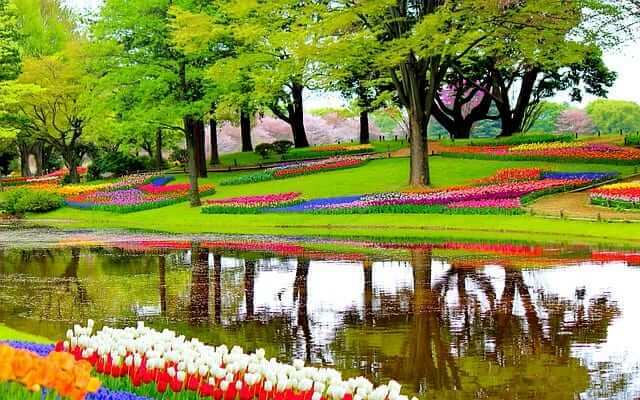 Netherlands: The country of the Netherlands comes to life during the Spring, and one of the most extensive gardens in the world will delight you with its 7 million bulbs planted each year in an array of colors and styles. It is indeed a sight to be seen in April. Children will also discover all the baby animals welcomed into the world at the local cheese farms. Be sure to purchase a bottle of milk to help feed the baby goats. You can easily rent bikes and explore the countryside. Portugal: If you prefer warmer weather, fantastic sights, friendly people and great food, then add Portugal to your list for favorite Spring destinations. Discover castles, towers, and beautiful pastel colored buildings with intricate tile work in Lisbon. 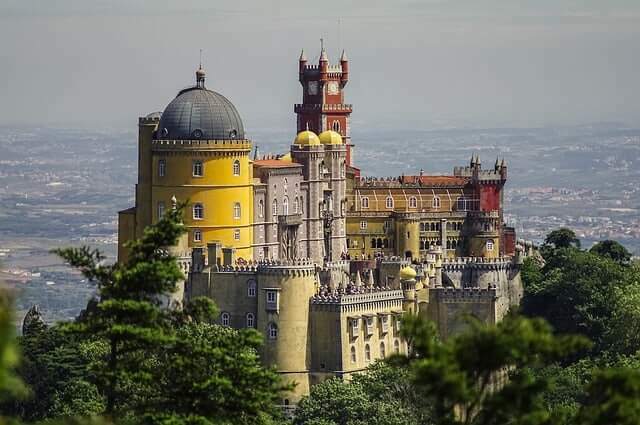 Then a day trip to Sintra for a step back in time to walk the castle ruins of Moorish walls, the vibrant colors of Pena Palace and the hidden tunnels in Quinta da Regaleira. 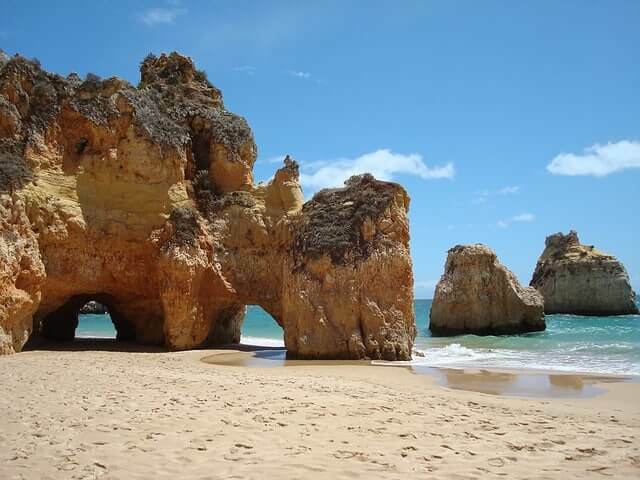 Finally, head down to the Algarve coast where the kids can play on the sandy beaches tucked into the arched cliff-sides. Paris: This is a favorite city in Spring with its trees all in bloom, playgrounds to explore and smaller crowds in the shoulder season before summer. Take the kids to the Rue Cler neighborhood to help build a picnic to enjoy on the grassy lawn in front of the Eiffel Tower. If they still have energy after running around the park, there are plenty of playgrounds nearby and crepe shops for a sweet treat. 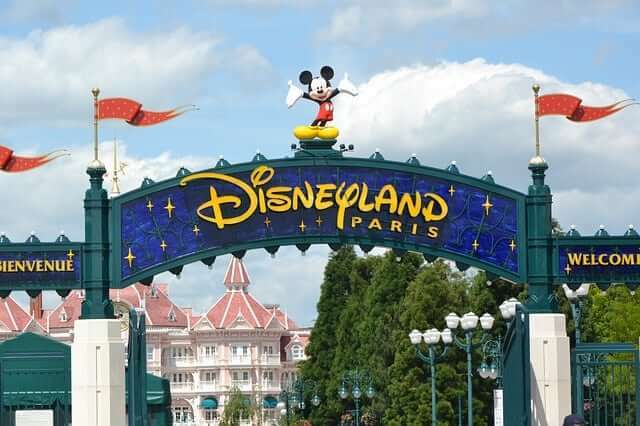 After visiting all the major sites such as Notre Dame, the Louvre, and the Arc de Triomphe, be sure to hop a train to either Disneyland Paris or Versailles. Mickey Mouse enjoys a fun French beret with all the traditional characters and rides the children have grown to love. Versailles offers an impressive palace with traditional gardens that delight with musical fountains and paths to roam. Summer: Europe is buzzing with visitors, but there are plenty of places to escape the swarms of people. The weather is warm, the cool waters of the Mediterranean and Atlantic ocean entice you to take a dip and gelato is always the answer in Italy. We liked to avoid the major cities during the summer and head to lesser-known destinations, here are some of our favorites. 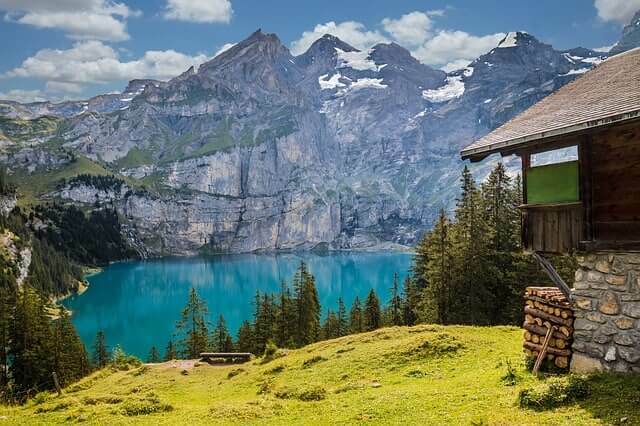 -Switzerland: We love the cooler temperatures beautiful scenery, cliff-side hikes, and alpine playgrounds. 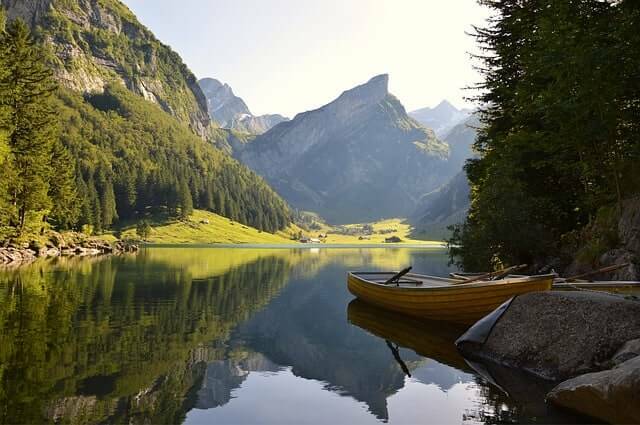 Switzerland is an outdoor lovers paradise! Older kids can enjoy in a bit of adrenaline fun such as zip -lining, mountain carts and parasailing. The whole family can see countless waterfalls, listen to the sounds of cows with their iconic bells and enjoy the delicious cheese fondue. -Normandy: I highlight Normandy for its D-Day celebrations in early June. A tad early for Summer, but if you are a WWII history buff or have family who has served in the military, this is an event not to be missed. My husband was lucky enough to be the air ops commander during our time in Germany and facilitated the jumps of hundreds of paratroopers during the 74th anniversary. I can’t begin to explain the experience of seeing the reenactors, listening to the stories from the men (now in their 80s and 90s) who took part in the events of June 6th, 1944. Even if you can’t make the events, be sure to visit the beaches of Omaha and Utah, walk through the town of Sainte-Mère-Église (the first own liberated by the Americans) and visit some of the museums. 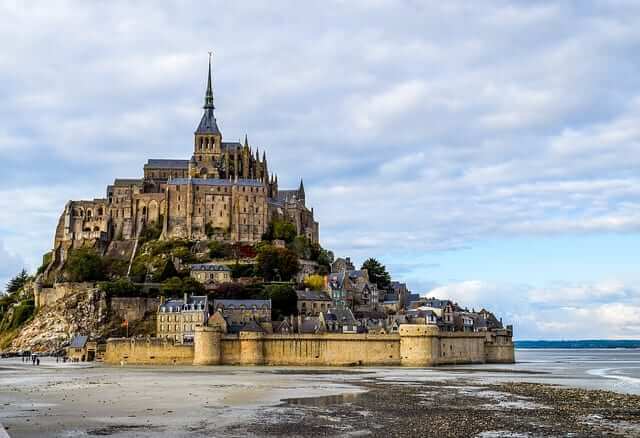 The nearby island of Mont-Saint-Michel will stun you with its beautiful abbey and surrounding town. -Germany: The many beautiful small towns, castles, and places to explore throughout this country make it a natural choice for travelers. 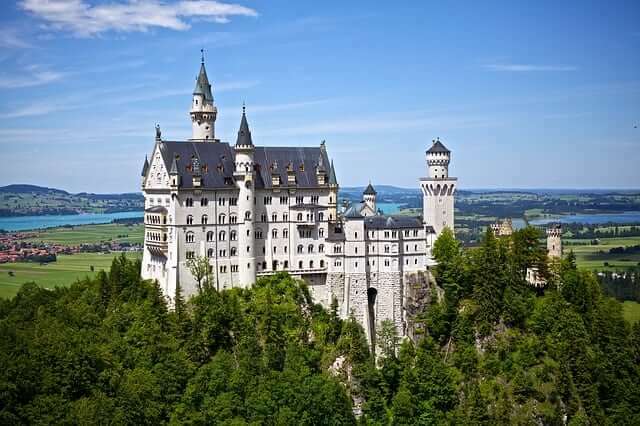 Our favorite area is in Southern Germany, with the romantic roads and castles such as Neuschwanstein (get tickets online), Hohenzollern and Château du Haut-Kœnigsbourg in nearby France (close to Strasbourg). 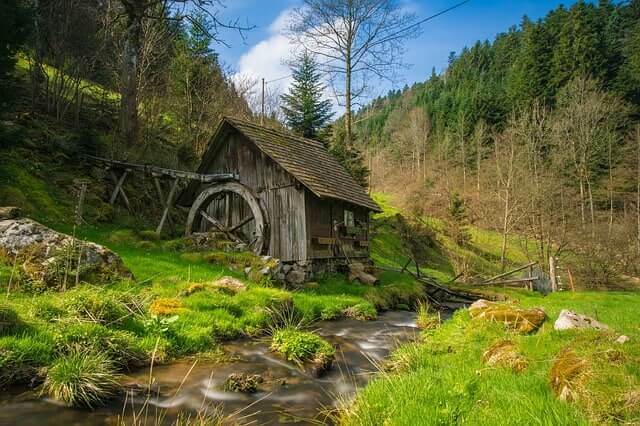 Be sure to detour to visit Triberg in the Black Forest to see the famous black forest clocks, ride down a mountain in a cart, linger on a treetop walk and enjoy some black forest cake. Fall: The best part of this season is the peace and quiet as families return to the schedules of school. If you have younger children or have a flexible schedule, this is our favorite time to travel. The weather is still warm, the best sights will be fun to enjoy and the prices will be cheaper. September is still warm enough to enjoy swimming and October makes for some great fall foliage. Here are some of our favorite travels in the Fall. 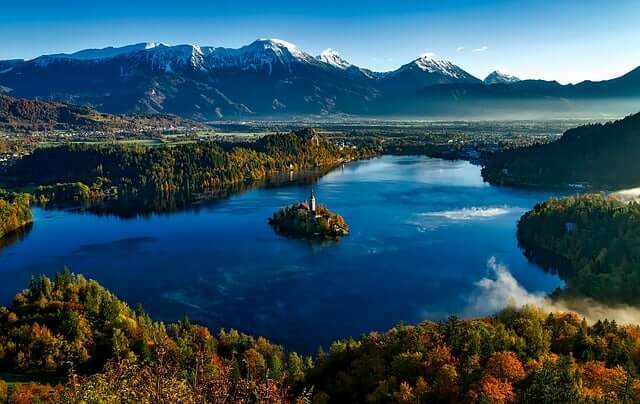 -Slovenia: This is a lesser known country that we fell in love with. 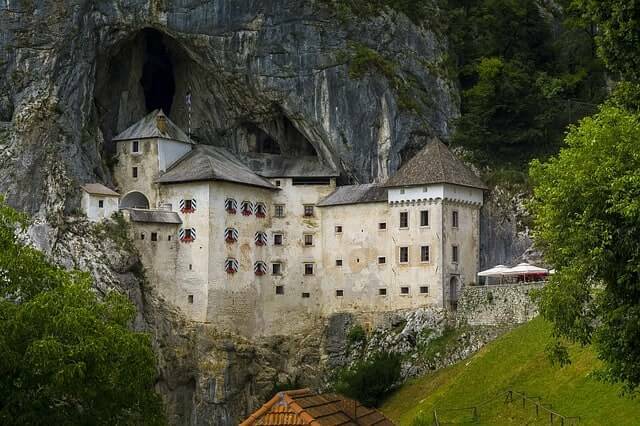 Spend a week around the Lake Bled area with day trips to see castles, caves, waterfalls and mountain tops. Lake Bled captivates its visitors with a small island with a church at the center of a crystal blue lake. Perched over the lake is the Bled castle with its ramparts and castle walls. Be sure to spend a day in the capital of Ljubljana; the Friday food truck market is not to be missed! 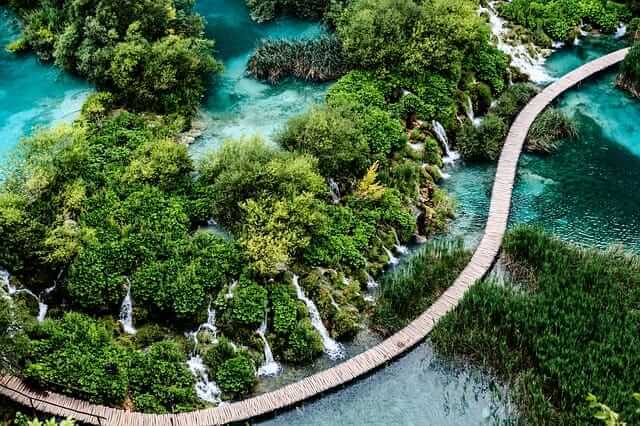 -Croatia: Another show stopper country with a mix of pebble beaches, blue lagoons, spectacular national parks (Plitvice and Krka) and historic charm. Dubrovnik is well known for its gorgeous walled city, but be sure to head up the coast to explore the many delights that cities like Split and Zadar offer. If you are feeling a bit adventurous, hire a chartered sailboat to explore the more than 1, 244 islands. Europe is considered a safe continent to travel in, but that doesn’t mean that there isn’t petty crime. These tips are intended to make you aware, not scare you from visiting. Like I say, if you make yourself a target, some people will take advantage of you. Europe is no less safe than most US cities. There are four advisories that you can look upon the U.S. Department of State website. Check for travel advisories to any country you are considering traveling in. Even though there are eight countries in Europe that are considered Level 2 (Germany, Denmark, Spain, Italy, France, Belgium, UK, Netherlands), we have traveled to all of those countries and wouldn’t have any hesitations or concerns regarding the safety of our son. You just need to follow the tips below. Enrolling in this program is a free service that will alert you about safety situations when you are traveling as well as a program where family and friends can get in touch with you during family emergencies. It is easy and worth your time. Also note the location of the nearest American Embassy during your travels. Saves time in situations such as losing a passport or having a medical emergency. Click here to register for you upcoming trip! It is important that family/friends are able to reach you and that you have a working phone during your trip. You can either call your current service provider to inquire about international service plans, or you can purchase a phone to use with an international phone number for the duration of your travels. Leave your trip plans with family and friends. Even if you are unsure about where you are going and how long you will stay, something is better than nothing. Let someone know your flights to and from Europe, within Europe and any hotels or airbnbs where you plan to stay. Often it is just to ease family/friend’s minds when they need to reach you. This is one of the most important tips, be vigilant of your surroundings, keep your belongings close by and watch your children at all times. Traveling to another country can have a whole host of things to think about, but making sure you secure your wallet, passport, camera and phone is high on the list. Pickpockets spend their time in highly trafficked areas and on public transportation. Using a travel bag, tucking items deep into pockets and trusting your instincts will serve you well. Tips: Bring a backpack and move it to the front of your body when standing or traveling through crowds. I prefer using a cross body bag with a flap over the top of a zipper, for extra protection. Also don’t flaunt flashy jewelry or expensive electronics, they can be easily swiped. Lastly, pickpockets use distractions to complete their “work”. Be wary of anyone asking you to sign a petition, look at something or asking for help. It’s sad, but you can’t trust anyone, so just keep walking and say no thank you. This one is really important, if something doesn’t feel right, then walk away. Trust your gut and let it guide you as you travel. There have been quiet a few times where things didn’t feel quite right and we turned around and headed a different direction. When comparing travel insurance companies, you want to look for a company that offers emergency medical care coverage, medical evacuation, trip cancellation/interruption, baggage loss and delay as well as 24/7 assistance. We’ve used and highly recommend Travelex Travel Insurance. They are a well known company, provided excellent packages, including additional add on’s to customize your trip. In addition, children under the age of 18 are free and included in the parents travel insurance purchase. Looking for recommended companies to work with? These are all companies that we can personally recommend because we have used their products, services and booked on their sites. Read more about considerations when you book an airbnb here. Booking is a one stop shop for all your travel needs. From hotels, to train tickets and dinner reservations, booking.com has it all. We like how easy it is to navigate their website and you can often find hotel rooms with “free cancellation”. There are no hidden fees like some other similar sites and you can earn rewards for using booking.com like discounts, freebies and perks. As always, be sure to check the reviews for any place that you are considering staying and on any activities that might catch your eye. Better yet, read my recommendations. Anytime I plan a trip, I comb through all the TripAdvisor reviews for the particular hotel, activity, destination or restaurant. There is always great advice and little tidbits of knowledge that isn’t anywhere else on the internet or in the guide books. You can also book properties on TripAdvisor, including smaller “mom and pop” type places and B&B’s. Family friendly homes with everything you need for a fabulous vacation. It’s like airbnb for families with kids. You’ll find safety features, play rooms, kids bedrooms and everything you can think of in your own home, but staying in another families home around the world. Every place is well vetted and hand picked. Kid and Coe is a great option for families who would like added benefits and comforts. Four moms created Mabel’s Labels as an alternative to masking tape and a sharpie to label their children items. They created personalized waterproof name labels and tags that were made to stand up to the tough love from kids. We love their Travel Label Pack to label our luggage, electronics and our son’s water bottles. They also have some nice kid friendly luggage tags. Check them out here! Packing will be dependent on which season and where you are headed, but below is a starting place to make sure you have everything you need for your European Adventure. Be sure you purchase sturdy luggage that will survive a few flights and have enough space for your belongings. 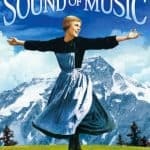 Check out this list of movies to watch and books to read or listen to. They will help get you even more excited for your upcoming trip! Lots of great kid friendly films and books. The library is also a great place to look for books to enjoy. Set in Denmark, it's a fun movie with a Prince finding love with a commoner. Get in the mood to explore Austria with this classic movie. A governess helps to raise seven children, but WWII looms and she helps them escape into the mountains. The perfect movie if you are headed to Italy. Frances purchased a Tuscan villa and while she fixes it up, she falls in love with an Italian, Marcello. 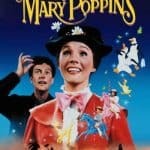 This London based film is full of fun with a nanny flying in from above to care for two children with her magic bag. Based in Volterra, Italy. The Twilight series New Moon is the second novel by Stephenie Meyer. It features the continuing story of the love between the vampire, Edward and his girlfriend, Bella. 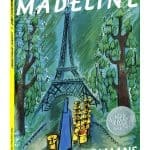 A tale of a brave red-headed little girl at a boarding school. Set in Paris, France. A young bull who grows up to be strong and large, but prefers to enjoy nature instead of bullfighting. Set in Spain. 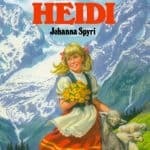 Heidi is an orphaned girl raised by her Grandfather. Set in Switzerland.